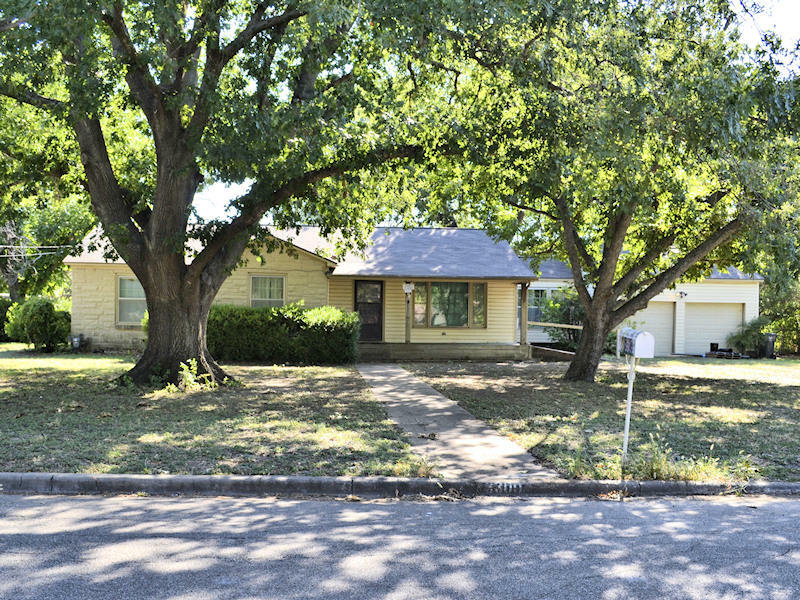 After living in a condo for seven years, Matt and I purchased our 1948 fixer upper in August 2013. 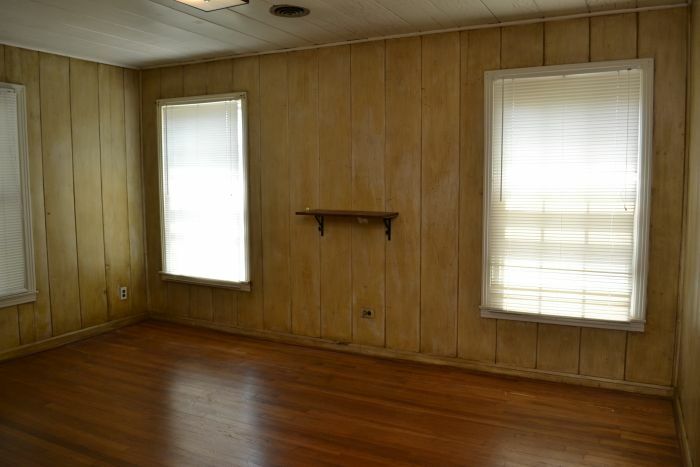 After we purchased the house, I spent some time removing all of the old carpet, removing a built-in closet that wasn’t original to the house, and refinishing all of the original hardwood floors before we actually moved into the house in October 2013. 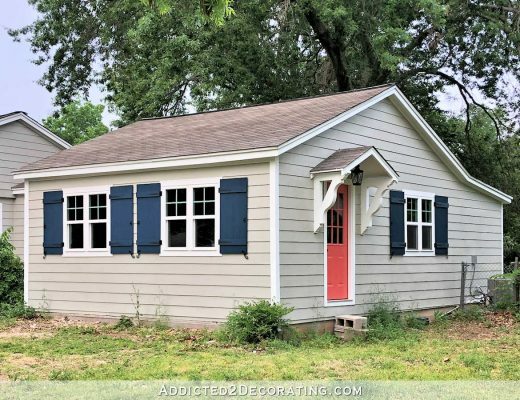 Scroll down the page to see all of the before pictures, current pictures, DIY projects, and related posts for each room of our house, as well as the front and back exterior and yards, or click on a specific room/area linked below. 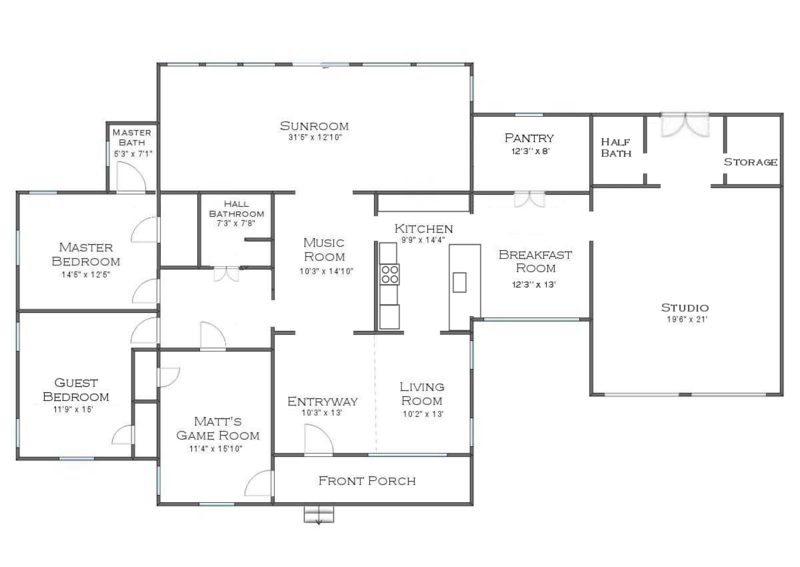 When we bought the house, the floor plan was what I would call “a good start,” but I thought it could be improved upon. We have made a few changes, but we’re not finished yet. What was once the den has now been divided to create a breakfast room at the front, and a butler’s pantry at the back. The garage has been converted into my studio (which is still far from finished) with a half bath and storage closet at the back. And we now also have a large covered carport out the back doors of the studio. 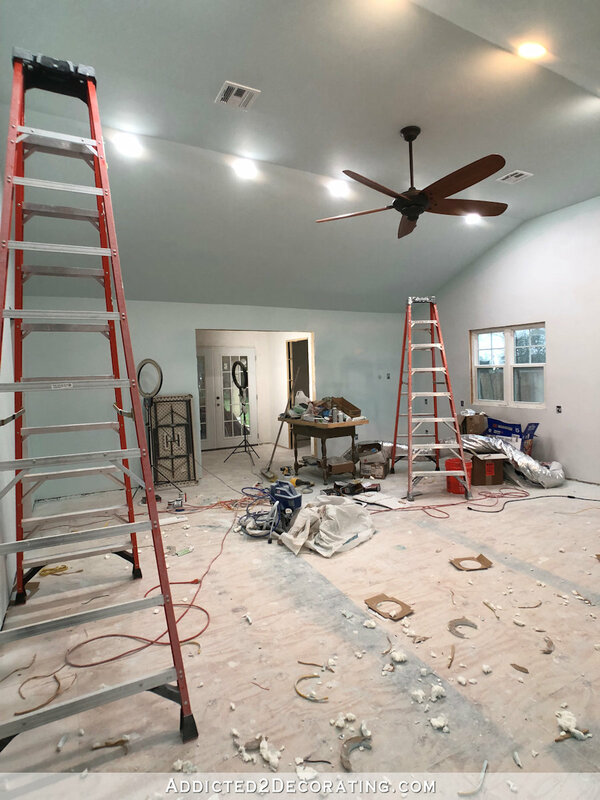 We haven’t quite worked out all of the details, but we will eventually tear down the existing sunroom and master bathroom and add on a new family room, laundry room, and master bedroom. Then the current master bedroom will be converted into the new master bathroom. We don’t have an official start date for that huge addition, but Matt would like to start ASAP, so we might see something happen on this in 2019! We’ll see. 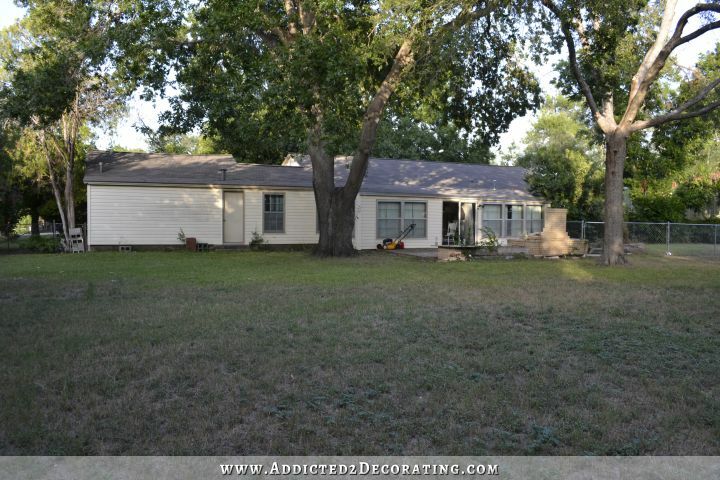 When we bought the house, the exterior looked tired and outdated, and the house had no curb appeal at all. I don’t have a current photo showing the entire front of the house with all of the changes that have been made, but so far, we’ve converted the garage to my studio (so the garage doors have been removed and replaced with windows), the old vinyl siding has been replaced with HardiPlank siding, the front door and some front windows have been replaced, the house has been painted, new shutters have been installed, the front porch and steps have been completely redone, and the old sidewalk has been replaced with a new wider sidewalk. Our future plans include lots of landscaping, landscape lighting, and a new driveway. The house doesn’t have an actual entryway, but that doesn’t stop me from calling the front door side of the living room the entryway. 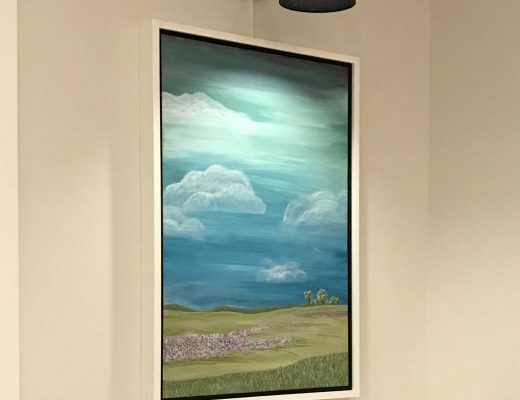 🙂 The area originally had green carpet and antique white walls. It took me four tries, but I finally got the entryway just like I wanted it. 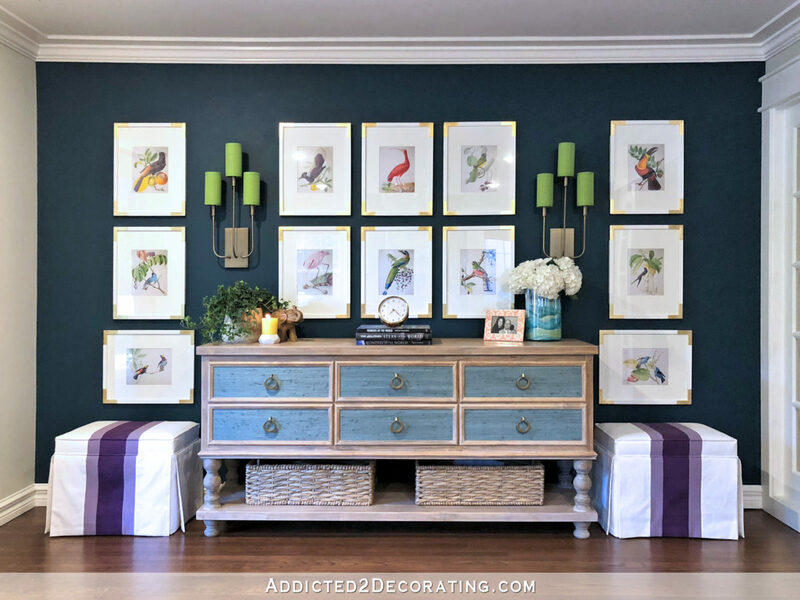 The finished area includes some of my favorite things — dark teal, birds, stripes, a gallery wall, and grasscloth. 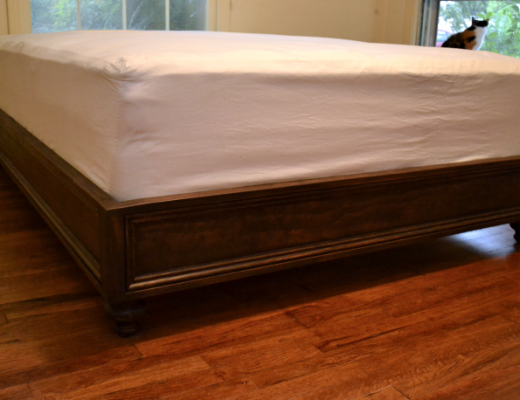 The ottomans and credenza are DIY projects that I built from scratch. 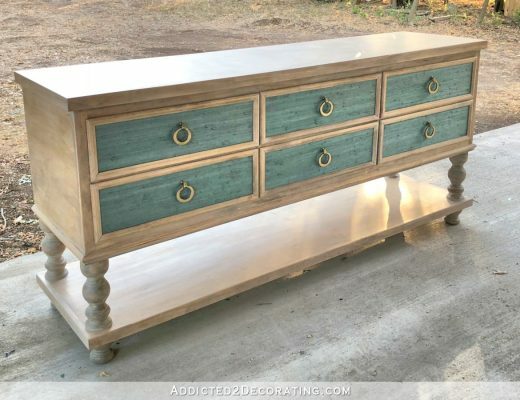 DIY Six-Drawer Console Table With Lower Shelf – Finished! The original living room felt very small and dark, with green carpet, antique white walls, and polystyrene tiles covering the ceiling. It also felt very closed off to the rest of the house. The room is still very much a work in progress, but it has come a long way since we bought the house! The whole room has been redrywalled, and I built a faux fireplace (with an electric fireplace insert) as a focal point. I have draperies to make, two chairs to upholster, and throw pillows and accessories to add. 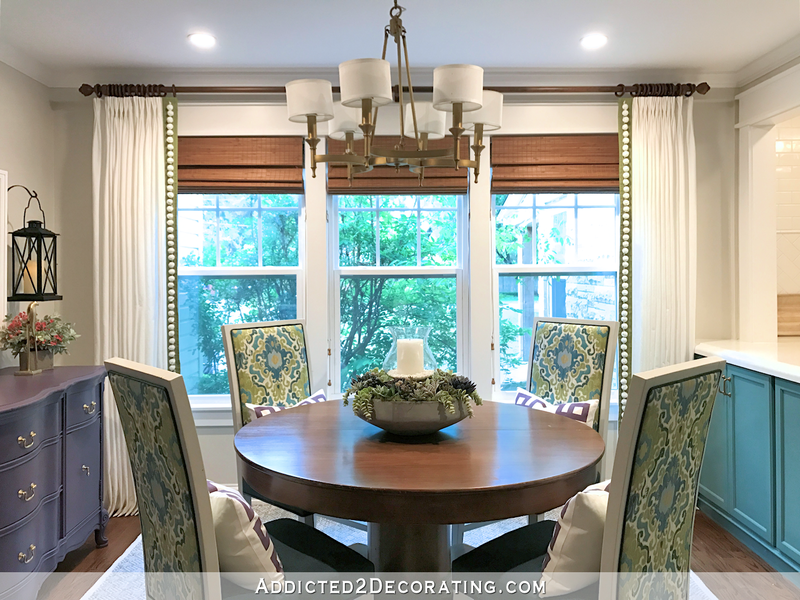 This room was obviously originally intended as a dining room by the builder, but with a husband who relies on a wheelchair for mobility, this would have been an impractical spot for a dining table and chairs. So I decided to call it a music room, and place my beloved spinet piano (the one my mom learned to play on as a girl) in this room. The room is still a work in progress, but I’ve done quite a bit of work in here already. I removed the original sliding glass door and replaced it with decorative doors that I made myself. And then I built bookcases around the door so that they would be more like pocket doors. 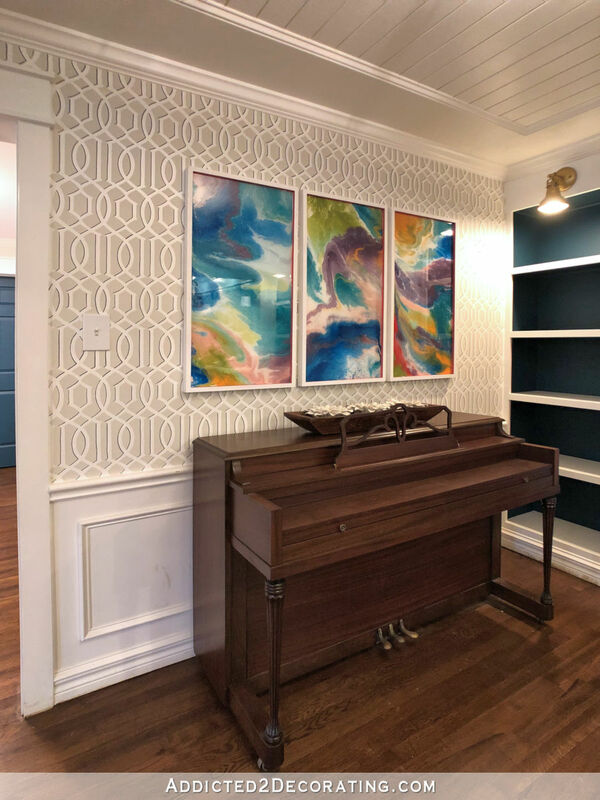 The walls have a hand-stenciled design and wainscoting, and I refinished my childhood piano, which now has a prominent place in the room. I still need to reupholster two chairs, do a few paint touchups, and then decorate the shelves. The original kitchen was very inefficiently arranged, plus it was walled off from the rooms around it, making it feel very small and cramped. 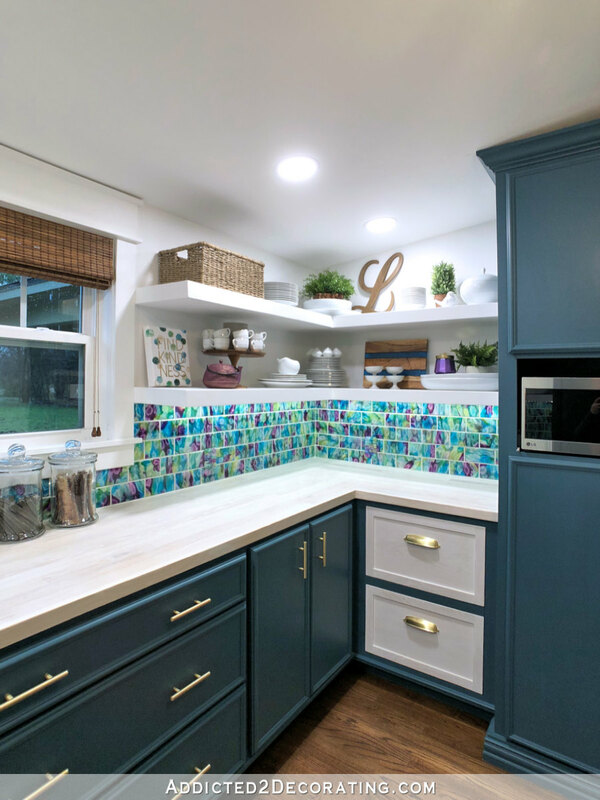 During the original kitchen remodel, I tore everything out to the studs and ceiling joists, and rebuilt the kitchen with a different and more efficient configuration. I used stock oak cabinets from Home Depot, and customized them with trim and furniture-style feet. 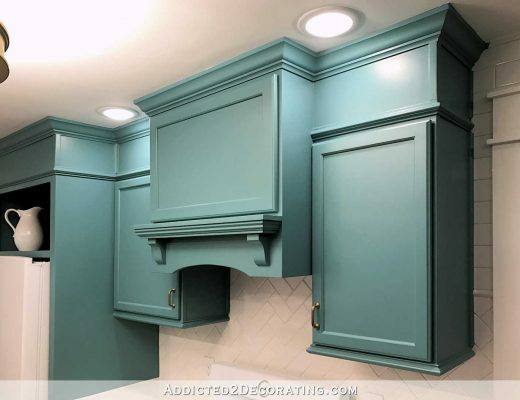 I originally painted the cabinets a bold green with gold leaf accents. 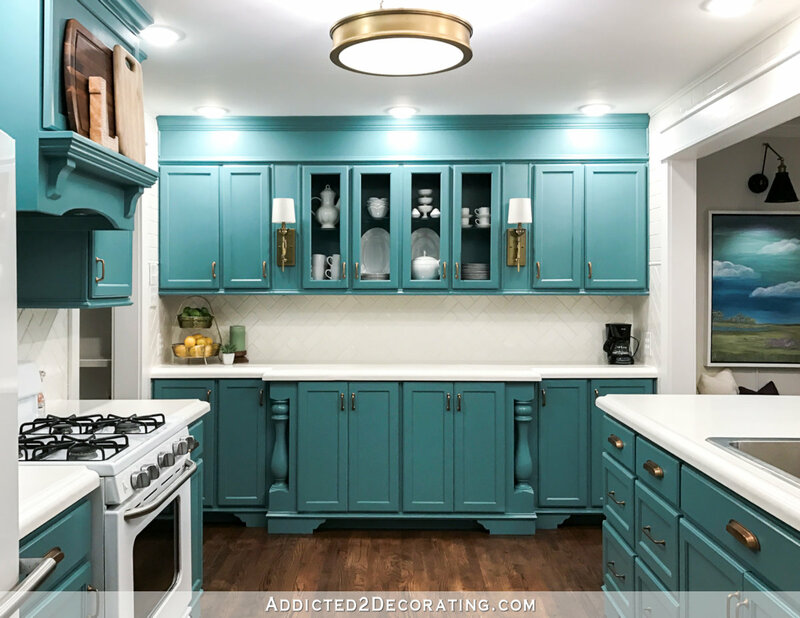 While I loved the green kitchen, I just found it hard to decorate around, especially considering that my favorite color is teal. So I ended up repainting my kitchen a couple of years later. The color? A medium teal, of course! What is now the breakfast room was originally a large room next to the kitchen that the previous owners referred to as a den. 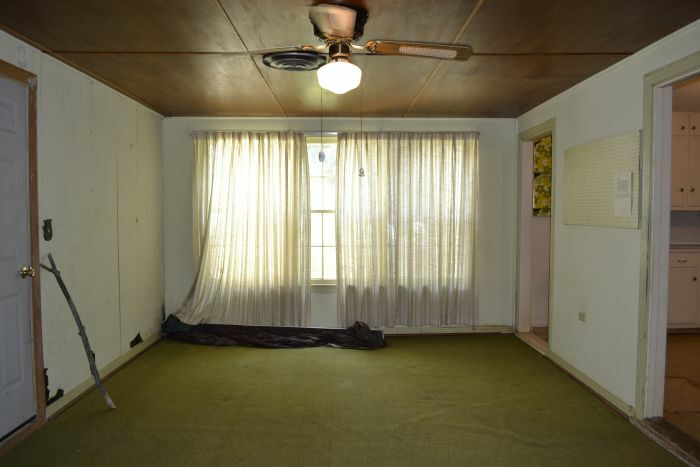 It was very dark and cave-like, with a stained plywood drop ceiling and dark green carpet. There was a wall separating it from the kitchen on one side, and a door that led to the garage on the other side. I knocked out the wall between the den and the kitchen to create the breakfast room that now feels like one big room with the kitchen. The house didn’t originally have a pantry, so I created one at the back of the den. What was the den is now the breakfast room at the front of the house (i.e., the windows look towards the street) and the pantry at the back of the house (i.e., the window looks towards the back yard). 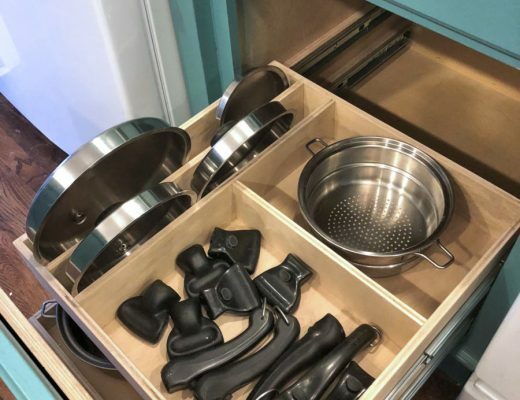 I built the entire pantry from scratch, including the cabinets, the wood countertop made from hardwood red oak flooring, and the floating shelves. 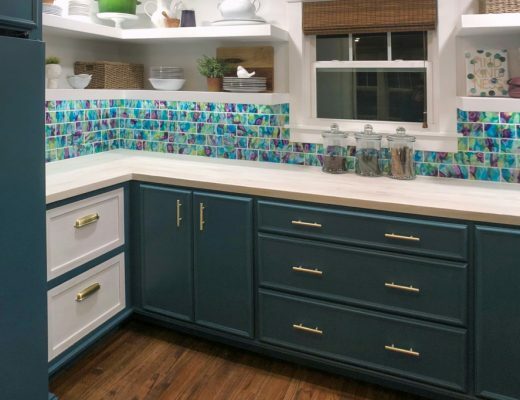 I even hand-tinted over 200 tiles with clear resin and alcohol inks for the backsplash, and painted my white utilitarian freezer teal to match the cabinets. 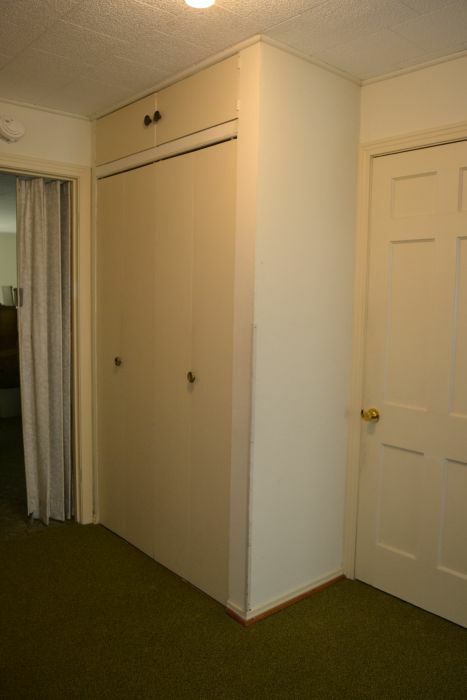 The original hallway was very dark, and at some point, a previous owner had built a DIY closet that seemed to crowd the hallway. Opposite that DIY closet was the original coat closet that housed a huge duct for the furnace. The doorway from the music room into the hallway was very narrow. 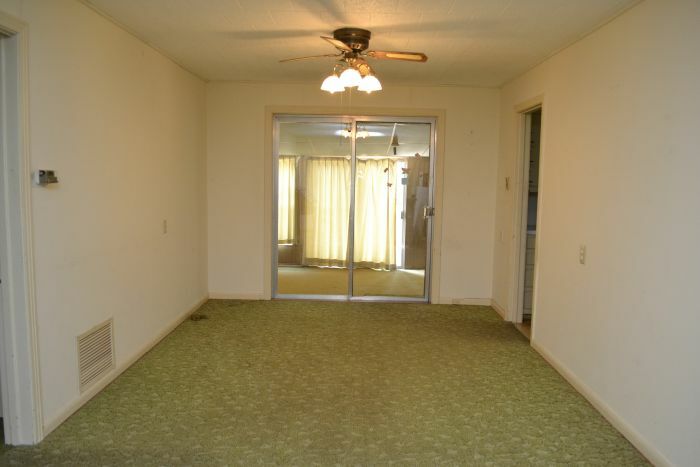 And just like the rest of the house, the hallways had green carpet and polystyrene tiles on the ceiling. The hallway now feels much larger after I tore out both closets and widened the doorway to about twice the original width. I added storage with a floor-to-ceiling DIY cabinet, and we use the bottom cabinet to house our cats’ litter box. The adorable side entrance that the cats use to access the box is a must-see. 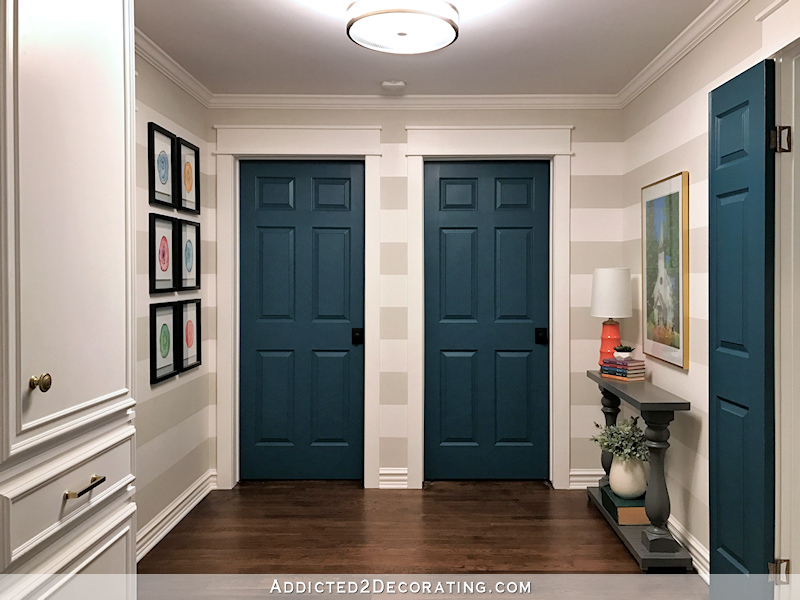 I painted all of the doors my favorite go-to color, teal, and spiced up the walls with some horizontal stripes. 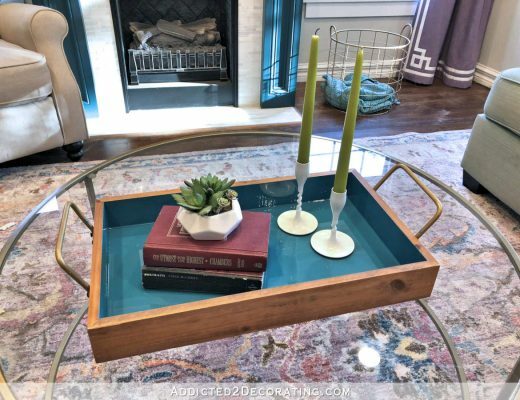 A DIY console table and some colorful artwork completed the look. The original bathroom felt even smaller than it actually was because of a narrow door, a door configuration that covered the linen closet, and a huge storage cabinet that had been built right over the tub, making the tub feel very cave-like. 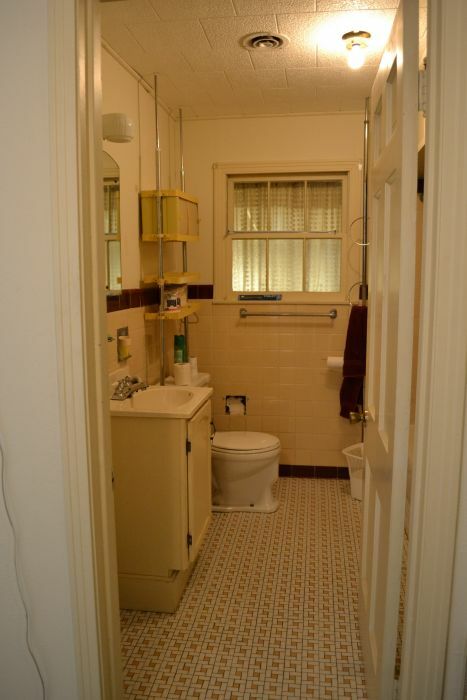 The original bathroom had a window that at one time was an exterior window, but now it just looked into the enclosed sunroom, which was awkward. I tore this room down to the studs, floor joists and ceiling joists, and completely rebuilt it. It’s the same size, but the new wider door and double door configuration make it feel more open. 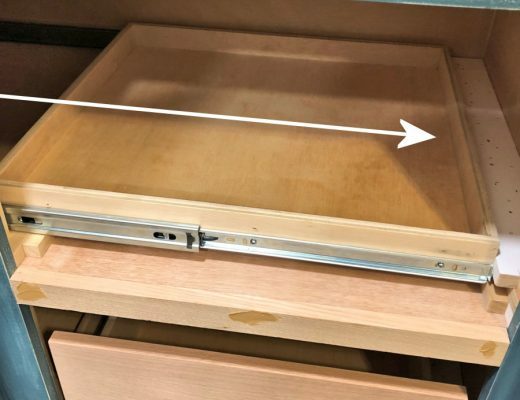 The original linen closet was replaced with a lower cabinet with open shelves above, and I built a much larger vanity to replace the original tiny vanity. 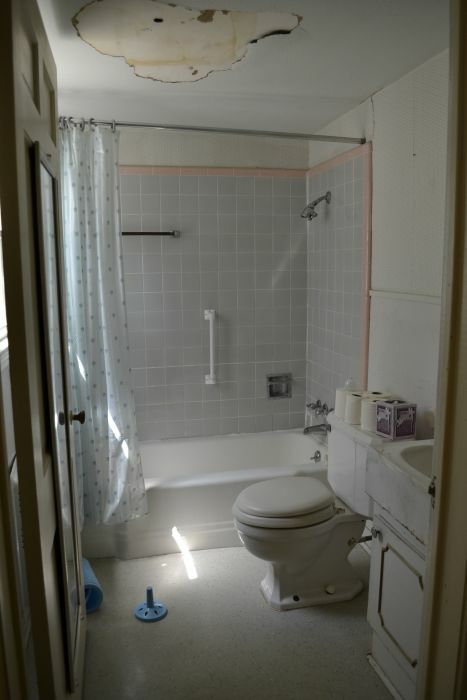 The original bathroom remodel was done before the hallway remodel. During the hallway remodel, I decided that I wanted the hallway (bedroom and bathroom) doors to be teal, so I painted the teal vanity gray. It stayed that way for a year, and then I decided that I couldn’t live with dull gray anymore. I needed color! 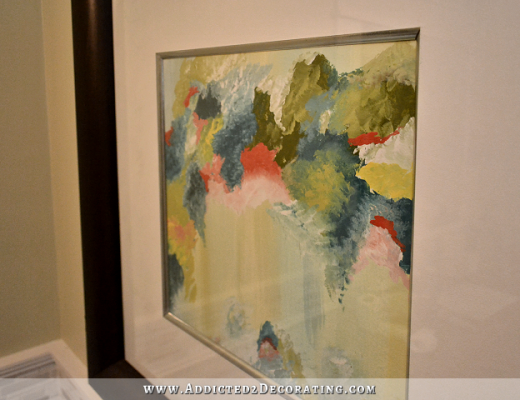 So I gave the bathroom a small makeover with a new vanity color, refinished countertops, a new colorful shower curtain, a brighter wall color, and some new art. I also painted some of the mosaic tiles to tone them down a bit. This was originally the garage, and while there were two garage doors presumably making it a two-car garage, the doors were so narrow that it was a very tight squeeze getting my Honda Civic through the door. My truck (and it’s a small one) wouldn’t fit at all. Also, the floor of the garage was about 18 inches below the floor of the breakfast room, accessible via a set of steps at the door. That made accessibility impossible for Matt. So we decided that this are would be better used as a studio/office space for me. A new pier and beam foundation with plywood subfloor was added to this room so that the studio floor would be level with the rest of the house. 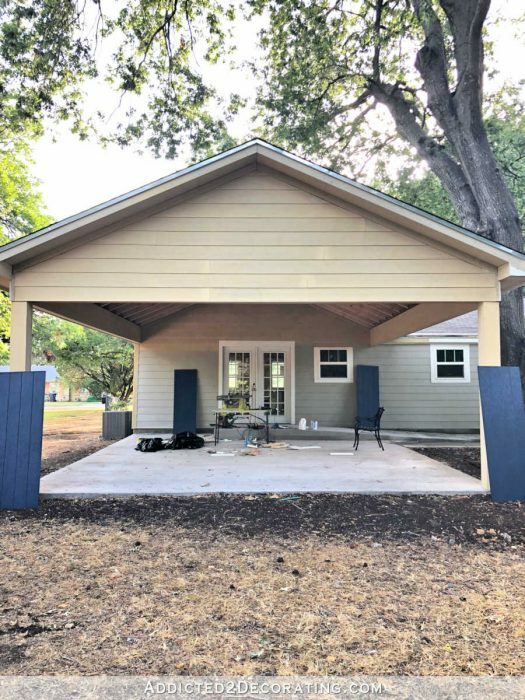 There were also come significant structural changes made so that the room could have a vaulted ceiling free from all of the visible (and very low) framing that was in the original garage. Now the room has new doors and windows, electricity, spray foam insulation, drywall, and is on its way to becoming an amazing studio. There’s still a long way to go to get this one finished. This will be the main project I focus on during 2019. The half bathroom at the back of the used to be a storage room at the back of the garage. It was dark with a really low ceiling, and this area housed the huge furnace. 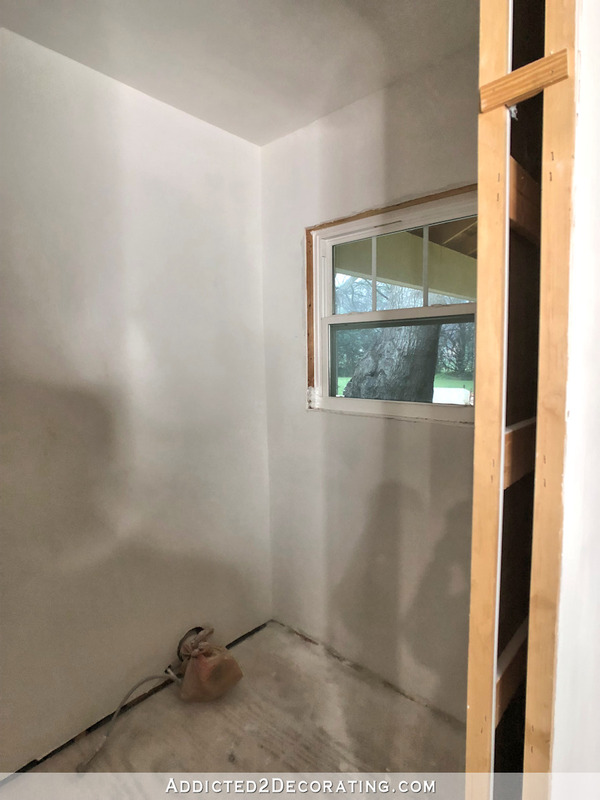 The window there in the bathroom is where the original back door was that lead from the garage to the back yard. Finishing this half bathroom will be part of the big studio completion that I have planned as the biggest project for 2019. 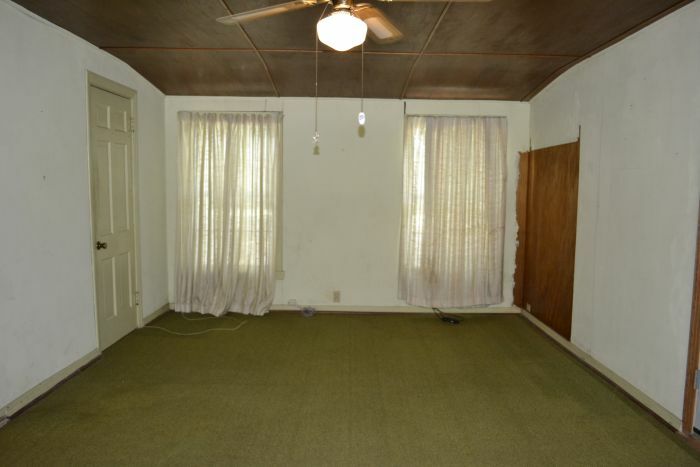 When we bought the house, the master bedroom matched the rest of the house, with antique white walls, polystyrene tiles covering the ceiling, and green carpet. 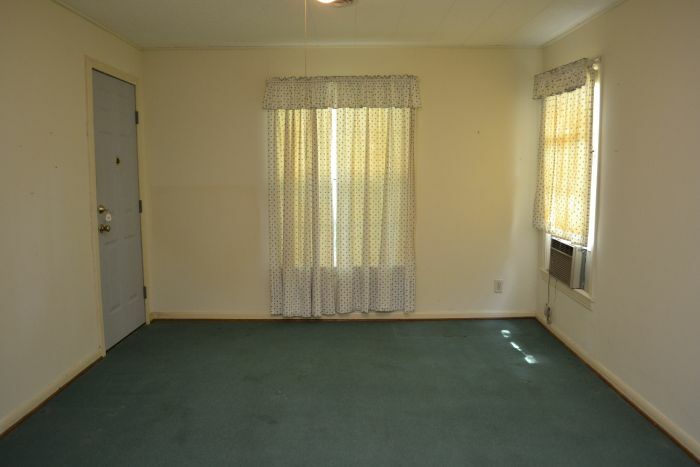 Other than the carpet being removed, the hardwood floor being refinished, and the window on the right being replaced with a door, this room has been largely ignored. We have a bed and two bedside tables, and that’s it. 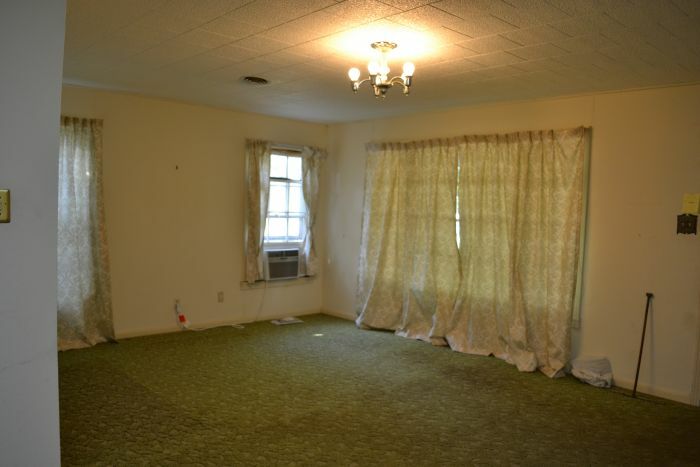 This room will eventually be converted into a master bathroom, so we’re not really wanting to spend a lot of time or money turning this into a beautiful bedroom. 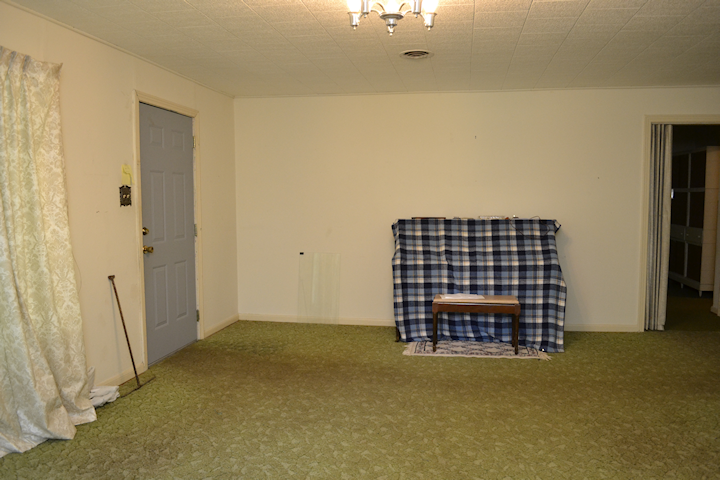 A new, larger master bedroom will be added onto the house behind this room. 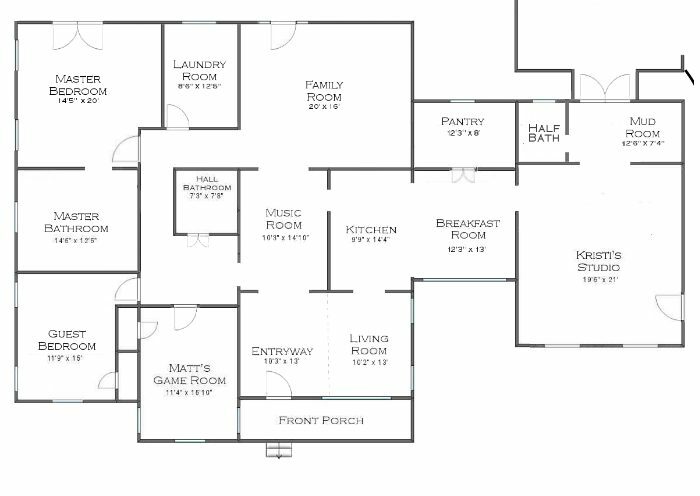 (See the floor plans at the top of this page for reference) If Matt has his way, we’ll begin the big remodel/addition in 2019. 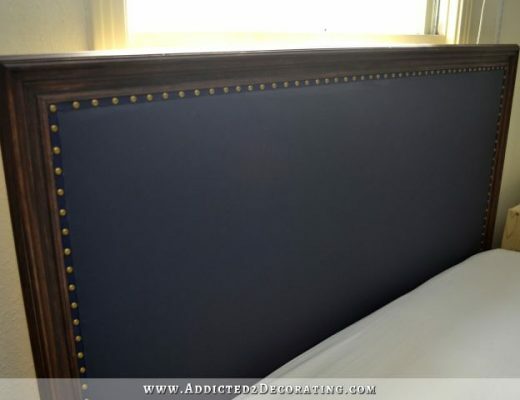 You can check out the DIY projects that went into the bedroom here. 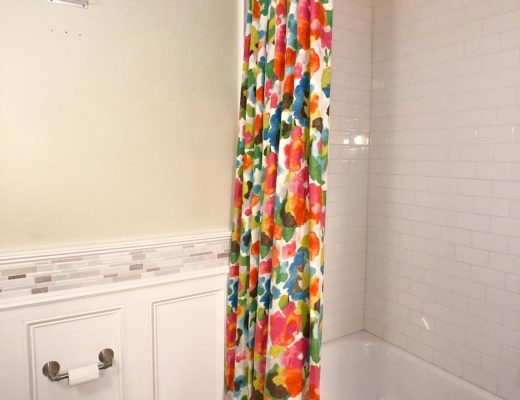 The so-called “master bathroom” is not original to the house. It was clearly added on at some point, and it’s tiny. I just keep the door closed and pretend like it doesn’t even exist. When we do our big addition, this bathroom will be torn down completely, and this is the area where the new master bedroom will be added. The guest bedroom was the only room in the house where the hardwood floors were actually exposed. It also had tongue-and-groove wood walls and ceiling. Nothing has been done to this room yet, other than us using it to store boxes of random stuff. But eventually, it will be a comfortable guest bedroom. 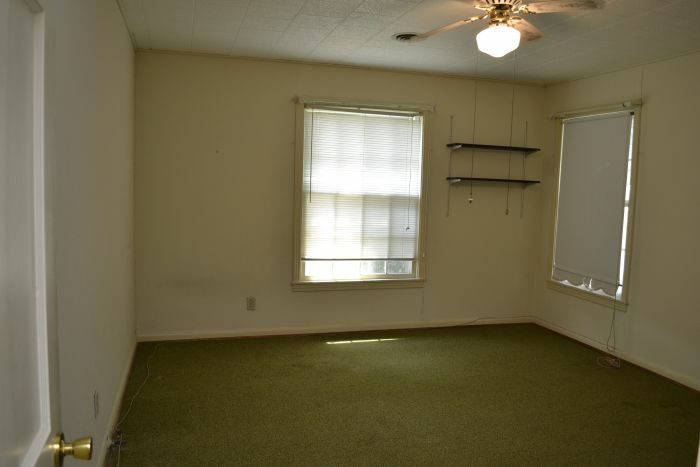 Another room, more green carpet and polystyrene ceiling tiles. This room hasn’t changed much. I did remove the carpet, and the floor has been sanded, but it still needs to be stained and sealed. The door has been removed and closed off. Other than that, it’s the same. This will eventually be Matt’s game room for his massive collection of video games and video game consoles. Video games are his hobby, and he loves to collect all types of consoles, from the oldest to the newest and everything in between. He’s still trying to decide how he wants everything arranged, but it will certainly be a unique project compared to the other things I’ve done. 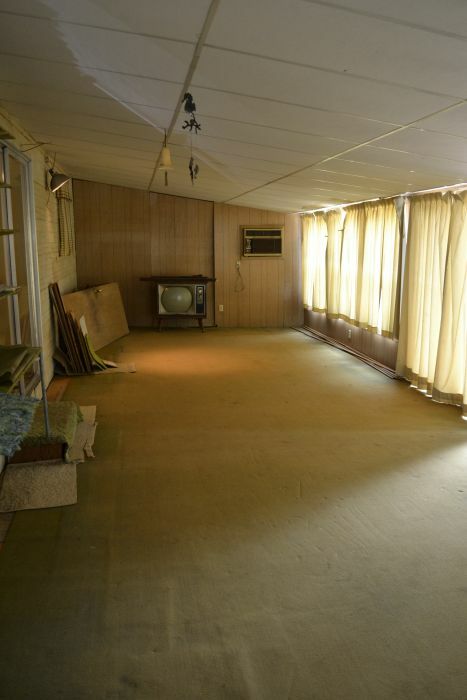 The sunroom is an addition by a previous owner, and it wasn’t done very well. There’s a big step down from the music room into the sunroom, which makes accessibility impossible for Matt without a very long ramp. The sloped ceiling isn’t even seven feet tall on the back wall. And the “subfloor” below the green carpet is particle board. I’m pretty sure it’s not even attached to anything. This room isn’t salvageable. It will eventually be torn down completely, and we’ll build an addition in its place that includes a laundry/utility room and a family room. The back of the house originally consisted of the back of the garage with one door, the back of the sunroom, the so-called “master bathroom,” and the back wall of the master bedroom. Excuse the shutters, but this is the best picture I have showing the progress on the studio side of the back of the house. The one single door was removed and replaced with a window. , and new French doors were added at the back of the studio. And then we added a big carport/covered patio area with a nice concrete ramp for Matt. The carport still needs trim, a ceiling, electrical wiring/lights, and paint. But it’s usable for now even without those things. Your house is turning out BEAUTIFUL! And coming from such a small 850sft condo, your huge house must seem daunting at times! That being said, since it is your “forever house”, taking your time and doing it right really is the way to go! You’ve got all the know how and talent to transform it the way that it needs to be to become spectacular! Hi I was googling remodeling ideas and found your website. LOVE it! Thank you for your ideas. Please keep us updated on your house. Cant wait to see the whole thing finished. You have brought back my spark for decorating and remodeling. Your progress is amazing. Your blog is the only one I read! Can’t wait to see each project. I am enjoying your website. The remodeling and projects are very informative and gorgeous. What you have done at the condo and in your home thus far is outstanding, and am eager for each posting. I have learned that what I was proposing to do would not be easy as you have just demonstrated (LOL). On top of that, I do not have your vision, skill or stamina in order to do the work. 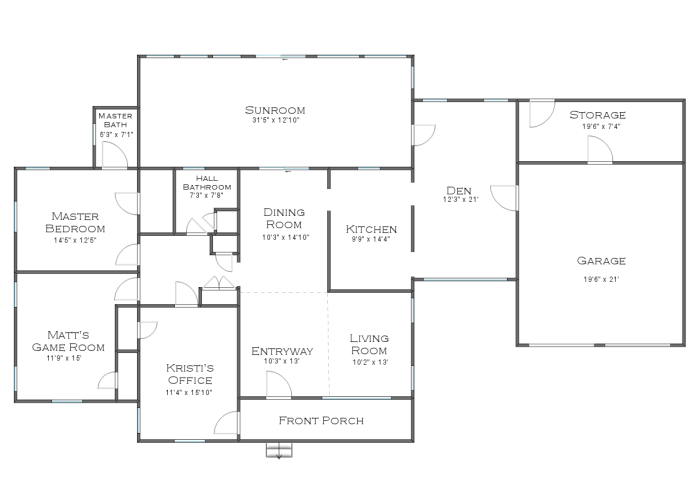 Anyway, I find one problem with the current and ultimate floor plan is access to the dining room from the living room. If you have formal guests and entertain in the living room, and will serve dinner in the dining room, you must access by going back through the entry, then the music room, into the kitchen and then into the dining area; or alternatively back through the entry, then the music room and through the den (in order to avoid the dinner-in-progress kitchen space), and then enter the dining room. Of course, I could be blowing the dining room access from the living room out of proportion. What do you think? The front of your house is going to be delicious! And what you have accomplished so far is wonderful…very impressed with your vision and skill! Looking forward to more from you…like a gal above, your blog is the only one I read. Plus you are not a hoarder…let me show you MY garage..lol..you are far from it sweetie. I absolutely love that you have the patience to live in a house that needs so much work in order to get things done in your own special way. It makes the process interesting and reading your blog great. Just amazing – your talent, your vision and hard work. You do inspire me to try. Kristi, do you ever scroll through your before and after photos when you feel a little despondent at how long this is taking. I’ve just done that and my goodness you’ve done so much and so beautifully. When I look at the before photos I think what made them fall in love with this place, and then I look at what you have done to it, and it is simply amazing. You really are a remarkable woman and an inspiration to many. 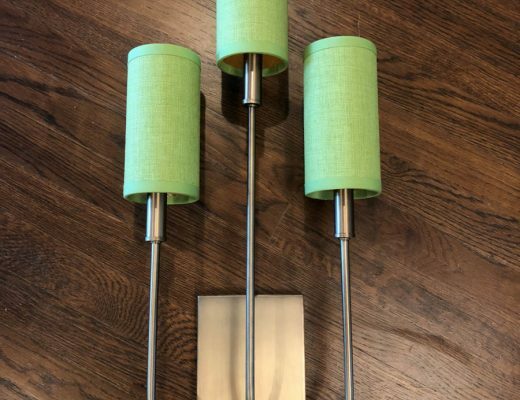 I do not know if you share information on where products were purchased, but I recently purchased a townhome that was built in the 80’s. 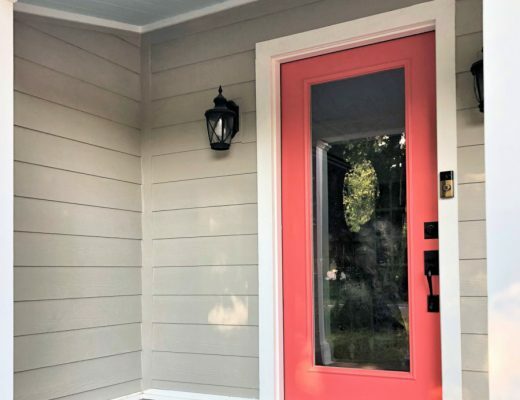 I would love to duplicate the doors you have in your “home” on the sliding doors. I would love to replace mine with something that has impact and durability. 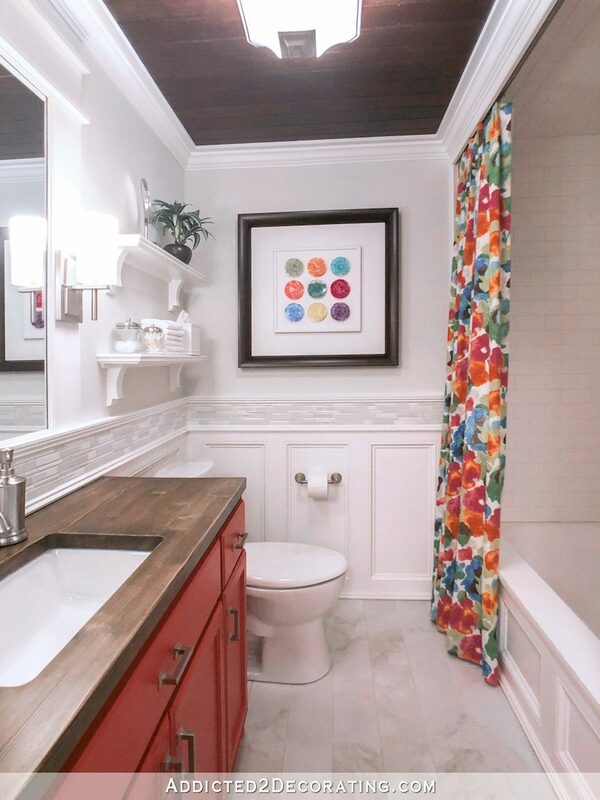 Also, is it difficult to do a paneled ceiling, or what material is used on the ceiling especially in the bathrooms. Would you be so kind to share the door and ceiling information. If not, keep up the great work, I stumbled on your website and have enjoyed your before and after pictures. 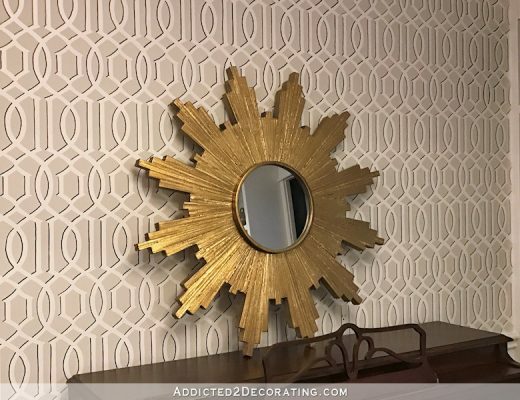 If you click on the “DIY Projects” tab for each room, you’ll see links to all of the DIY projects that I’ve done for each room. Under Music Room, you’ll find the rolling doors, and under Hallway Bathroom, you’ll find the wood ceiling. Click on those links and you’ll find all of the detailed info for those projects. Looking amazing! I cannot believe how much you can do and how beautifully you do it. You are an inspiration girl! Wow! You are so talented! Living room, bathrooms and kitchen are just beautiful. 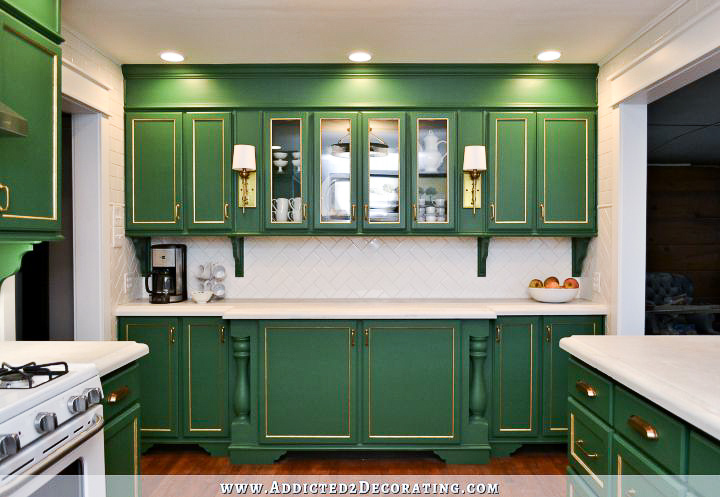 LOVE the green kitchen, it’s the perfect green and the cabinet lighting is inspired. Now I’m feeling inspired. Thanks for sharing your talent and ideas, just great. wow! your work is just beautiful. You’ve such talent.I have been following you a while now.it’s so refreshing that the house isn’t finished..it just makes you human.I find that encouraging. Best of luck with it Im so lookig forward to meeting all the finished rooms.keepd doing what you do as you do it so well. You go girl! I have found a kindred spirit. Just like you, doing it myself is a beautiful journey that I must take. I have been looking for a sight just like yours to follow. Thank you for sharing. Wow you are doing an amazing job! I can’t decorate to save my life. Did you go to school for design? I read that you wanted to. Looks like you did. ?? I lived in Turkey 33 years ago. I love your web site!!!! 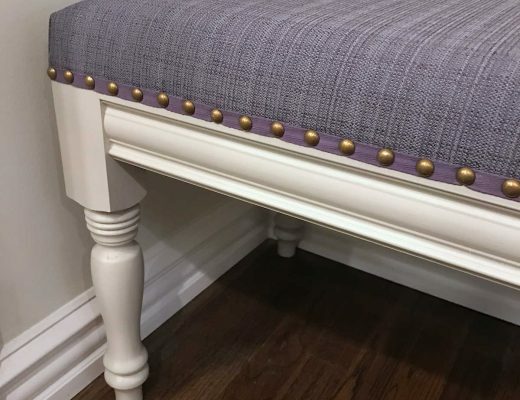 I like to add about 18-20 extra inches on the length and width to allow for the tufting. Hi, Kristi. 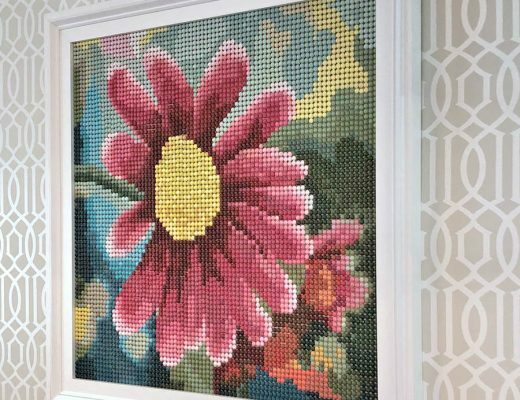 I just found your blog and have really enjoyed reading about all of your projects! 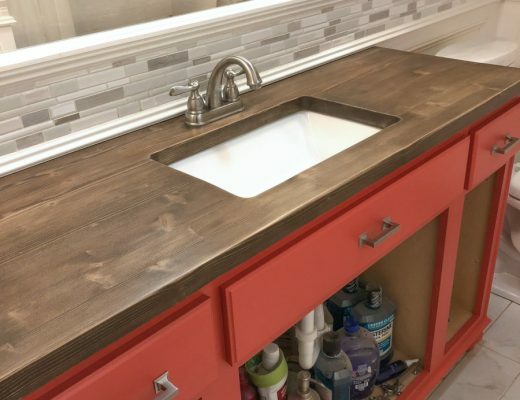 Your bathroom is beautiful, and I love your kitchen too! We used to live in Waco, and I certainly never saw a kitchen like yours- very European feeling, stylish, and unique. I also appreciate how honest you are about your design process and life in general. It’s so nice to hear the perspective of someone who’s extremely practical, yet loves a beautiful home. I look forward to reading about more of your ideas and accomplishments, and I wish you the best! The sunroom could be a beautiful greenhouse/3 seasons room. Thanks for brightening my day today by sharing your home and your journey. Wow. It gives me hope for my own house and what I might try to tackle once we finally get possession of it! You are really inspiring me! Greetings from Canada! It’s a really cozy and nice home, that has a modern feel to it. What a great project! The house is coming along nicely! I hope you saved that cool antique TV that was sitting in the sunroom! The floors are turning out great, and I love the wainscot in the entryway. Living in an old house myself, you are giving me some ideas! What a great way to present your project! Love it 🙂 I look forward to seeing how it goes along. You are so awesome. Thank you for being so transparent with your readers. I really like how you illustrate renovation for real people. Most people have time and budget constraints and you show how to make it possible given those realities, unlike DIY Network, where a professional goes into a house and does a makeover in an hour – lol. I’ve often felt overwhelmed watching one of their shows, while I get inspired by your enjoyment of one project after the next. Accomplishing one thing at a time makes the journey so much more fun and worthwhile, doesn’t it? 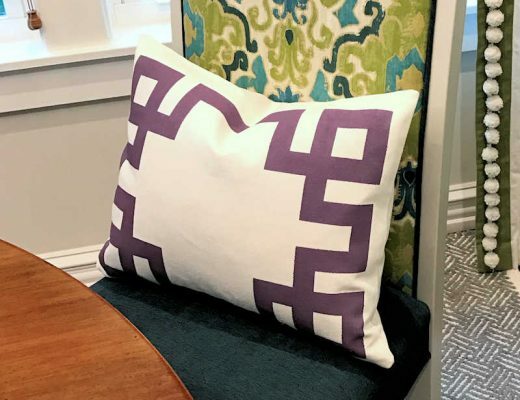 You have a seriously great eye for color and design! I don’t even remember how I cam upon your site few days ago. I kept looking at your bathroom and comparing the before and after pictures. It finally dawned on me thats my in-laws bathroom! 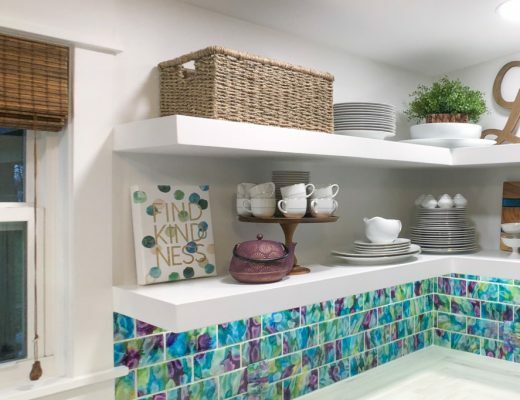 Well, except with pink and purple tiles and minus the storage above the tub. It’s the same size same set up including the window, closet and tiny sink in the exact locations and it so needs to be remodeled. Can’t wait to show my mother-in-law. Hope it will motivate her when she sees it can be done. Thanks for sharing. You are awesome! By the way I want to open my den into my living room with a french style doors. Any tips on cutting an opening in a wall? You think it can be completed in say 14 hrs while my spouse is at work? Sorry for the late response! The main thing you have to know before cutting into a wall to create an opening is whether or not that wall is load-bearing. Do NOT cut into a wall without knowing for sure. If you cut into a load bearing wall and start removing studs without taking the necessary precautions, the consequences could be devastating. You could certainly open up a wall and get quite a bit done in 14 hours, but I think it would take longer to actually get it completely finished, especially if you’ve never done it before. I would also strongly suggest that you have a helper. You’ll definitely need one if you find that the wall is load-bearing and will require temporary support during the project. First off….love your home and what you are doing to it. I am also a DIY gal who loves to see what I can create. Everything is coming along so beautiful. 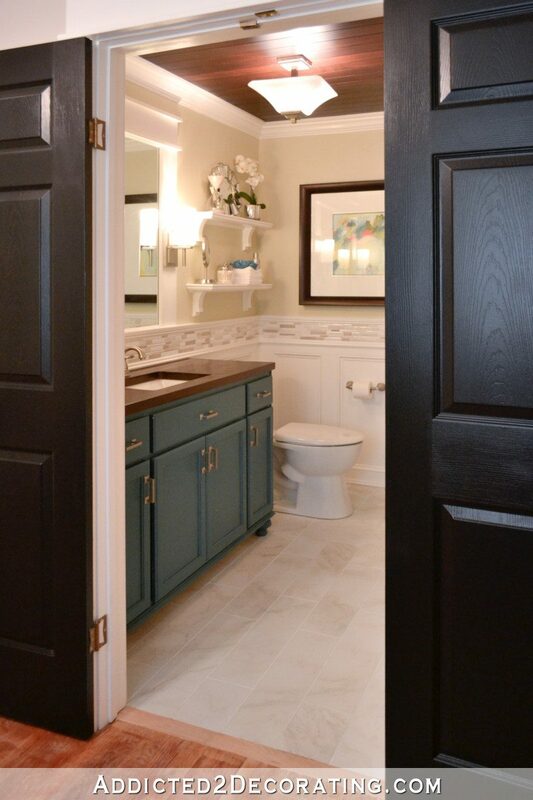 But I must say….your hall bathroom looks twice the size after your remodel. can’t wait to keep following and see everything finished. I am in awe that you are able to take such a basic looking house and make it look historic and beautiful. It makes me jealous that you have such skills. Absolutely beautiful! So lovely, I love how you’ve added panelling to the walls, I think it’s really maintained the character of the house, while the decor is so modern. Oh my such talent; your ideas and results are gorgeous; I wish the right side of my brain was as creative as that. I just bought a house and have to finish the inside; I am so overwhelmed with the details and the only thing I have done yet is put pine on the ceiling. Love your work and colour choices. 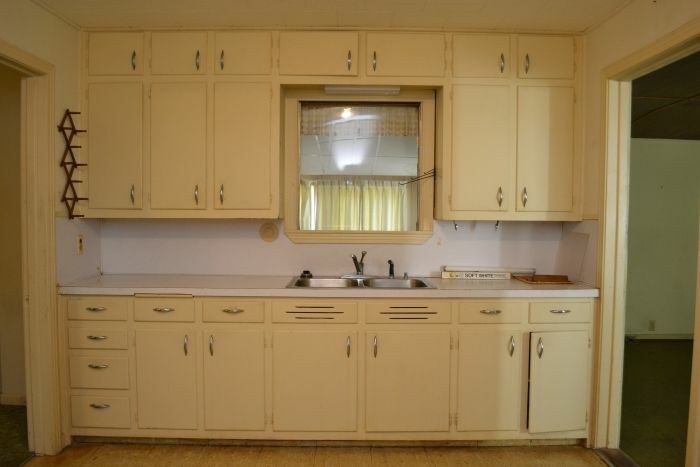 We will be borrowing your trim idea for our 1970 bungalow reno coming up in 2017! Maybe I missed it, but did you ever consider moving the kitchen into the Breakfast Room space and turning the kitchen into a dining room? If so, I would love to hear your thinking about that. Love your blog and anxiously look forward to each new post! Thank you for sharing your journey with us. I bought a 1941 rambler about 3 1/2 years ago and have been steadily refurbishing it on a toddler-size shoestring budget. I’m finally working on my kitchen and hope to have it finished by the end of March. You’ve inspired me! You SHOULD be a general contractor. I’d hire you, that’s for sure. The areas you’ve finished are simply astounding. I LOVE that bathroom. So unique and classy!! Absolutely LOVE your vision and design!!! !Can’t wait to see all the things you will be doing to the rest of your home!!! Just beautiful……and the Entry Way???? Knocked my socks off…love it!! Love the way you put this remodel together old by new. I’ve clicked back and forth several times to try to capture how you got to new. Hope to see the project finished, it’s like watching a movie and can’t wait to see how it ends. I’ll be checking back! You have such a great sense of line and composition. 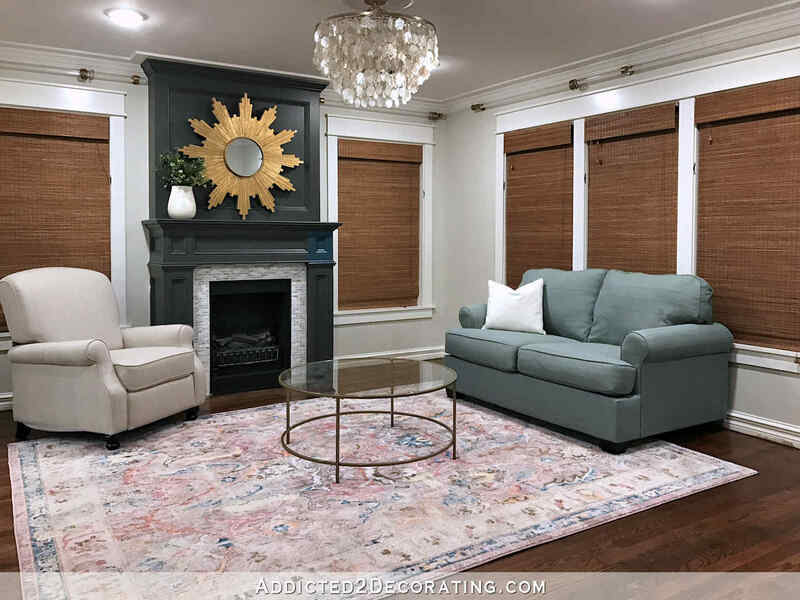 First decorating site I’ve subscribed to! I love your entry way mural! 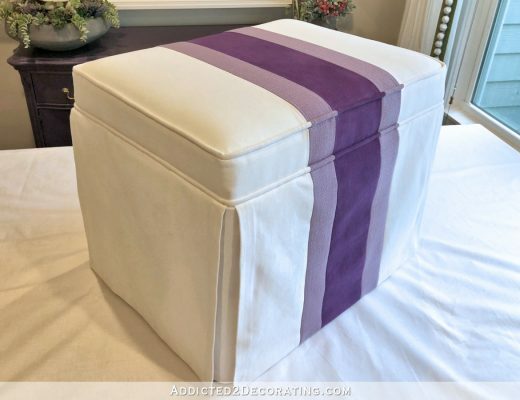 I stumbled on your site on how to make Euro shams and then read your other diy projects. I love diy (to saves $) and I deplore purchasing anything with “retail” mark ups. 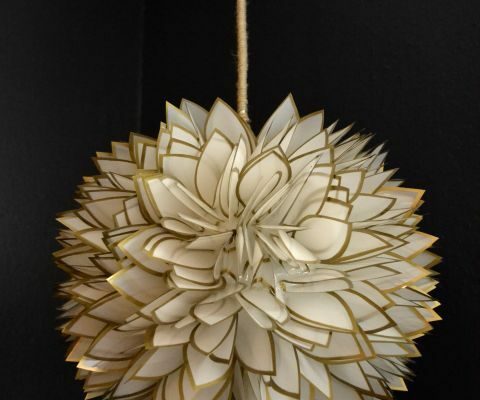 Your diy projects are so inspiring! 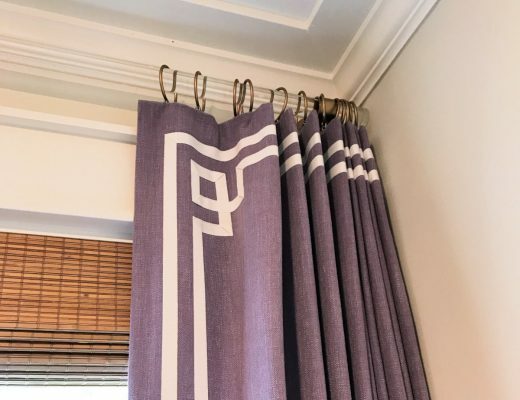 I also hang my curtains as high as the ceiling too to add a drama, theatrical look. Looking forward to see more updates on the rest of the rooms in your house. Hello! All I can say is OMG!!! I have become an “empty nester” recently. To improve my mood from missing my boys, I decided to spruce up the house. I found your website when I was looking for ideas and am so glad I did. 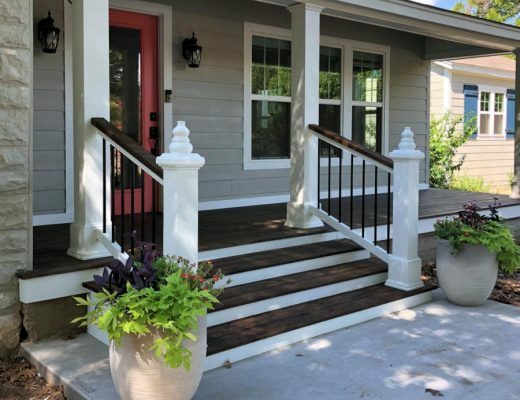 I love seeing the transformation of your home. You have me hooked! You are quite the inspiration, young lady! Just found your site. Girl, you are so talented! Your vision is truly a gift and I don’t have it. Another amazing thing…your website is so easy to navigate. I appreciate the way you’ve set up your tours for each home and room (before, current, DIYs, etc.). So glad I found you. Thank you for sharing your abilities and progress with us! You did a great job. I was a lot of hard work but I’m sure it was worth every effort. 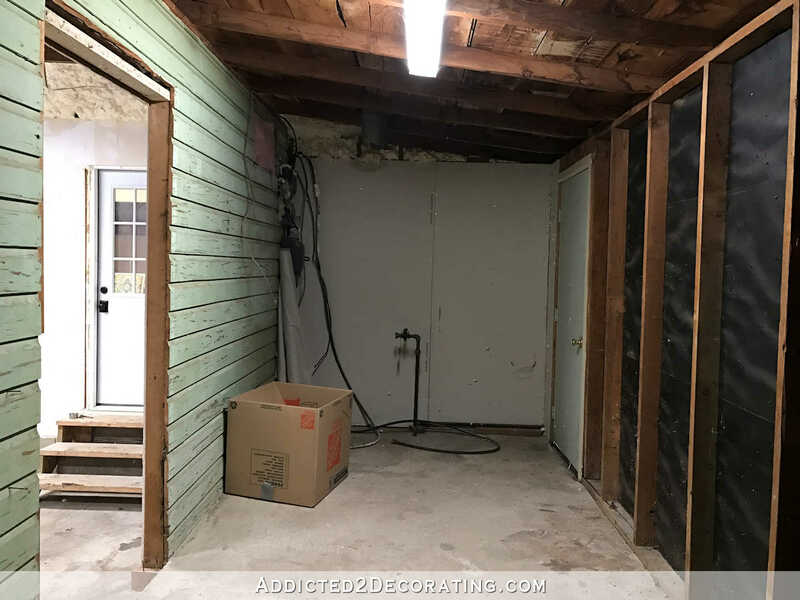 Hi Kristi, I found your site through a random search along the lines of “do people get depressed during a home renovation” which led me to the blog article you wrote describing just that! I want to thank you for so candidly and kindly (and in such an organized way!) 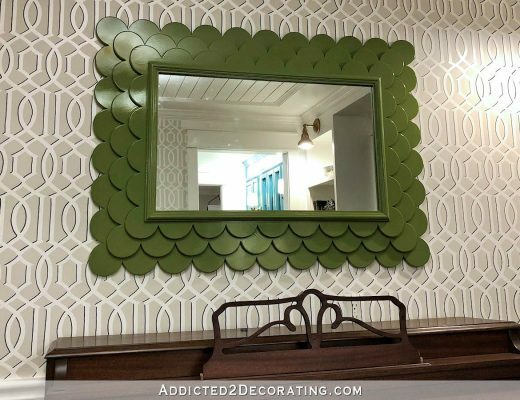 sharing your projects + thoughts on renovation/remodel/redecorating. Good for you for following your dreams and going back to your interior decorating passion, you are an inspiration to follow your heart! 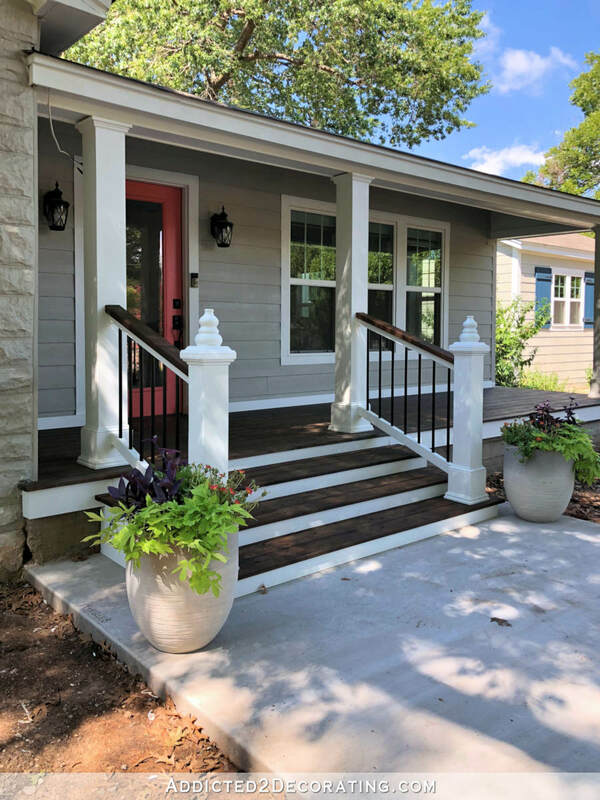 Your website gave me some much needed comfort in knowing renovation blues are real, and some much needed inspiration + hope from seeing the beautiful results after the hard work that you put in. 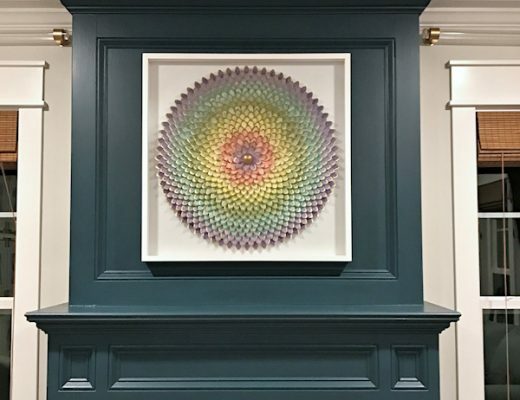 Thanks for sharing your updates, and like other interior decoration admirers here, I do hope you will continue to share the progress of your projects. Hi Kristi. I gotta make a guess what you do next. 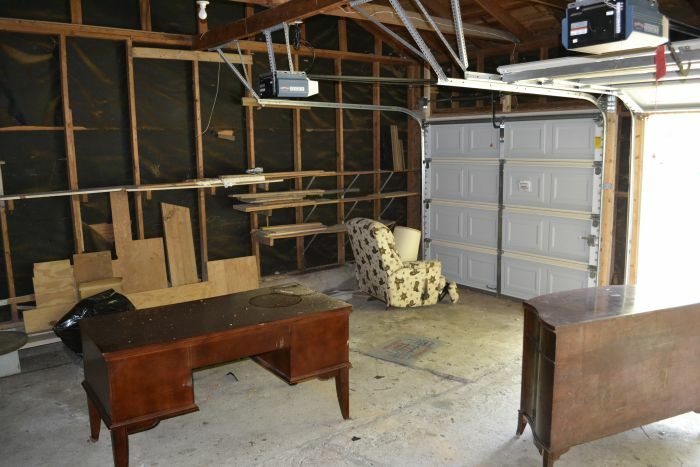 Garage and half bath? Or Matt’s game room? Or did I guess both wrong? Kristi – Gosh, I’ve been following you since ‘way back in the condo days. I get a kick out of reading comments of newbies to your site. They’ll become fellow blog addicts, I’m sure, in large part, because you are a dynamo and don’t keep us waiting for much of anything. You’re always on the move! But the comments/questions that always get me are the ones that start, “Did you ever think about doing…..such and such………?” I think it takes a long time fan to understand how thoroughly you think through every teeny detail, and then sometimes re-think, and then do, and then re-do, because you want it the way you want it! I love that, by the way! Every iteration of each project is more beautiful than before. I’ve said it before, and I’ll probably say it again: There must be something in the water in Waco!! Much love! Yes Kathy. I so agree with you on the newbies 😂 I too have followed and watched for a long time and sometimes laugh out loud as I’m reading wondering…..haven’t they ever gone back and looked at/read other things as well? I followed a long time before ever posting, to just get a feel of how Kristi does things! I love it! I love your story. 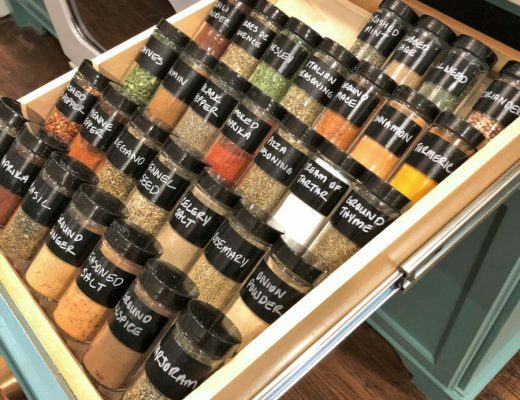 For a long time, I couldn’t WAIT for that pantry project. I loved every minute. Now I can’t WAIT for that studio project. I am excited that Matt wants to start the addition (TeamMATT! Go Matt!). I barely watch TV anymore. I follow you and a handful of YouTubers. Better than anything on TV! I have walked into houses like yours, or looked at them on line, and thought: “Oh, no, no, no, no. There is no possible way to even work with what is there. And yet you have transformed the areas that you have done in such an amazing way, and they are gorgeous spaces. I look at them and think, “Oh my god, that’s gorgeous,” even if they are sometimes have a wee bit more color than my heart yearns for. I love your blog. I love that you love what you love and have no f*cks to give for those who want you to paint things white. And I love that you can just put some of those rooms on the back burner and let them wait their turn until you can make them fabulous. And that you just kind of quietly turn it into a house that is accessible for you hubs and just beautiful. Did I mention that I love your blog? Go you. Ahh, your house looks really lovely! You did an amazing job and I love how you styled everything. Thanks for the lovely pictures!